On Oct. 23rd, 2017, Dr. Philip Landrigan was interviewed by U.S News to talk about the U.S. government limits on arsenic in drinking water that have likely averted hundreds of cases of lung and bladder cancer annually. A government study published this October estimated that 2 million private well users may be exposed to high levels of arsenic in their drinking water. High levels of arsenic have been linked to an increased risk for a broad range of cancers, including skin, lung, bladder, kidney and liver cancers, the researchers noted. It can also threaten the nervous system, respiratory function, heart health and the immune system. “The findings are consistent with data from previous studies of the health benefits of reducing arsenic concentrations in drinking water,” Dr. Philip Landrigan wrote in an editorial that accompanied the latest study. To read the full article click here. This entry was posted in In the News on October 23, 2017 by mountsinaitceee. 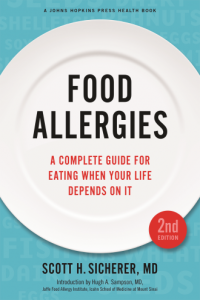 New York allergist Dr. Scott Sicherer has just published an extensively updated edition of his book: Food Allergies: A Complete Guide for Eating When Your Life Depends on It. In the book, Sicherer answers about 1,000 food allergy questions in an engaging, easy-to-follow format. In the following Q&A, Allergic Living editor Gwen Smith lobs a several of our readers’ questions at the specialist, who replies with informative, engaging and sometimes surprising answers. To read the interview click here. This entry was posted in In the News on October 19, 2017 by mountsinaitceee.